First Line: Detective Chief Inspector Maigret of the Flying Squad raised his eyes. Warned by Interpol that a notorious conman known only as Pietr the Latvian is on a train bound for Paris, Inspector Jules Maigret of the Brigade Criminelle arms himself with what little he has (a description and a few clues) and heads for the Gare du Nord. When he gets there he discovers that several suspects fit the description very well indeed, and it's up to him to deduce which is the real criminal and bring him to justice. No one can claim to be a true fan of crime fiction without at least having heard of Georges Simenon and his iconic Inspector Maigret. With my rather poor track record in reading classic crime, it's taken me awhile to sample this series. 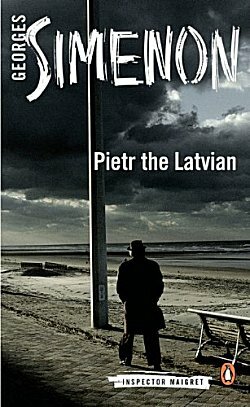 Pietr the Latvian is listed as the very first Maigret mystery, originally published in 1930, and it has all the earmarks of an author trying out new ideas. From the very beginning, I felt as though I'd been dropped on my head in the midst of the story. Although the feeling of disorientation gradually wore off, it did return from time to time. From the first, there is something grand about Maigret, and it's not just that he's "a mountain of a man." There are some wonderful descriptive passages throughout the book, but there are also places where Simenon drops the plot and wanders a bit-- and I never did quite understand why Pietr the Latvian was such a major criminal. This new translation reads exceptionally well-- no dated feel to it at all-- but the original was written almost ninety years ago. Simenon was a writer of his time, so if his occasional unflattering references to Jews and Eastern European men are offensive, consider it as a period piece. Even though I could see Simenon experimenting throughout this book, I could also see many instances of brilliant writing and strong storytelling-- proof of what this series would become. I'm not going to be in a huge hurry to continue with Maigret, but this is certainly a series to which I will return. Translated from the French by David Bellos. I know precisely what you mean, Kay.